It’s at least moderately entertaining. If you like guidelines and best practices, you might like something new we’re cooking up. We prepared a small but mighty resource to help you click Publish with confidence. These are the ways to make your content stand out. Nothing says more about a blog that has unique content and is worthy to read. Heck, people can read somewhere else more with more authority if they want to. Be unique and provide value to people’s problems. That is key. All of these points are very valid in today’s world, more than ever. Nice Article! As Samuel has already said, excellent article. This is a good checklist for any content marketer who is interested in running a successful campaign. However, I do feel though that marketing is as important as the content itself. I see repeated content from any reputable bloggers everyday which is overshadowing the excellent content written by many smaller bloggers. But, I guess this is just the way the Blogosphere works! I couldn’t agree more. I think one of the points should be ‘Be Patient’. I am 100% behind your first point. You want to control you own content as best as you can. There are so many opportunities online for other people to talk about (for good and bad) your brand that you need to take control wherever you can get it. I like this post and the #1 resonates with me. You’ve to own the land you’re building a content marketing apartment on. I didn’t realize the urgency of registering my domain name when I started but I’m glad I did now. 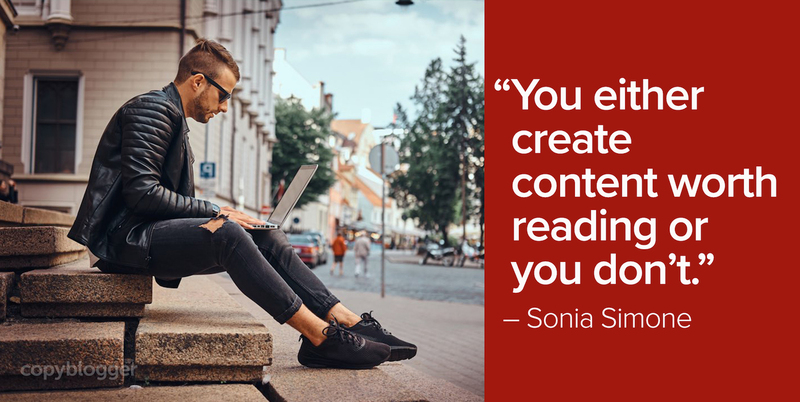 Thank you Sonia for waking me up to the world of content marketing. I love reading this checklist and learnt new things and certainly having a checklist before writing any article is easy to analyse at the same time what will happen with what you have crafted. This list comes at the perfect time. This is something I have been struggling with for the past several months. I have been thinking ways to make my website more effective in promoting my business. I didn’t want to go through the process of a redesign, but I can make some small changes and redesign my content. Thanks Sonia! You always there to help when I need it. This came out of a Q&A call with our new group of Teaching Sells members, there seemed to be a real need for an outline of the foundation. Maybe now more than ever, because the online world has become so complex. Great post – I find that #9, looking to sell via your content is often the one that gets overlooked. Of course, content marketing isn’t about direct selling – but it doesn’t mean that you should forget about looking to sell to your audience completely when the relevant opportunity comes up! Putting your content in the right environment is a lesson I am finally getting tons of benefit from. When I started blogging two years ago, I didn’t give my contents the superb environmentbit deserved. I suffered long before I did something about it this year and guess what? Just changing the look of my site to the powerful genesis framework theme took my content marketing efforts to a whole new level. Traffic increased, bounce rate dropped from 78% to 5%, page views increased from 2000+ monthly to 13000+, subscribers increased with about 25% monthly. Most times reading these posts, one might be tempted to think all these tips don’t work. Put like the saying goes, nothing convinces better than RESULTS! Thank you Sonia for a nice chacklist and great work to you guys at Copyblogger Media. Thumps Up! Thanks for sharing this great article. Full of insights and thoughts. And I personally love #10. Nowadays a lot of bloggers/businesses are using the power of social media. I love this list, althought I am still working my way through the lower levels. I think patience is key – don’t be in a hurry! Rome wasn’t built in a day, and neither will your blog audience. Nothing bothers me more than the ‘Put up a blog today, make money tomorrow’ hype that runs around on the internet. Awesome post Sonia. I especially liked #1, #7, and #8–too many bloggers are hosting with WordPress.com, not marketing their content through different channels, and not capturing their visitor’s email address to keep in touch with them. You almost touched on it a couple times (with the email section plus the idea of not waiting too long to make an offer) but have you written a post on that all-too-important-yet-often-overlooked page: the “thank you” page (the page people see right after joining your email list)? That’s probably the best place, among other things, to place a great offer. Because at that point your visitor is about as hot a prospect as they’re probably ever going to be, and even if they never read an email from you again they will see the thank you page. And if they don’t buy right then–hey, they’re still on your email list so you can send them those autoresponders and get more chances to impress them with your content and make offers to them. Anyways, that’s just something that a lot of bloggers haven’t taken full advantage of that could be expanded on to make a great post. Thanks for all the awesome info today Sonia! If you’d like a checklist of things to remember and some examples of what works for others, just let me know! Step 8! That’s where I was. However, I forgot some of the first seven and landed up hardly. I was going to get on another Guest Post Sprinkling round on blogs without any goal or anything but thanks to you, I’ll be spending some time on building my blog properly first. Definitely have a strong foundation first! That way you squeeze the absolute most out of those guest blogging opportunities. This is an Awesome Checklist Sonia! I like point #1 and #3, these two are very important. I have also discovered that a blog design also tells on how well your blog perform. Am glad I read this post. ‘The best time to plant an oak tree is 20 years ago – or today’ – that’s one of your comments that stays with me when I try and rush or feel frustrated. Thanks Sonia – awesome post! I need to work on drafting my cornerstone content landing pages! Awesome list Sonya. I can see your husband’s carpet and it’s a terrific visual for my blog homepage. This is also a great example of evergreen content. I could probably read this article every couple months to see if I’m making progress. Sonia: This should be mandatory reading for any entrepreneur who does marketing today. I also just installed Genesis Generate theme, which I like a lot – it’s very clean and elegant. Sonia speaks the truth! Just like always. I totally agree that you should not advertise your goods on social media until you have a blog. Thanks for taking the time to write this post. I enjoy reading this. It also has helped me brush up on a few things I had forgotten. Getting back into the “game” after two years sure had put me at the start of the line; however, this piece has cleared many things on my mind; it left me motivated to get back on the “horse.” Thank you! Thanks for a useful post Sonia. At point 7 – I signed up to your mailing list (see it works !) – prodigious link building in there too. Not much else that I can add that already hasn’t been said except that this is why I’ve invested in Genesis themes and Premise. You guys rock! 3. Produce great content that captivates your ideal audience. That means: great headline, interesting and entertaining content, content about your core ideas (cornerstone content), worth sharing, and just overall something you’ll want to showcase for months and years to come. I wouldn’t break this into separate steps; content that isn’t worth reading won’t work as cornerstone content. 4. Capture email. Don’t worry about your ranking on Alexa, Technorati, or even Google. Do your absolute best to get visitors to give their email to you. Sure, you can use other sales funnels and you might want to measure success with sales. But really, my advice is to optimize email capturing as soon as possible… And an email list that you don’t use, is a worthless email list; get subscribers to engage you back (and eventually to buy from you). 5. Cast a wider net. Guest posting, interviews, personal networking… Whatever method you use, building your audience should be a priority as soon as you have something to direct that audience to. Great article Sonia. If I where to add an additional point it would be as follows – however it’s really just expanding upon point 3. Small businesses need to allocate one individual to blog for them. Once they have set ‘guidelines’ for blogging in place they should have absolute faith in this individual and allow them to get on with it, with minimum supervision. As soon as blog entries needs approval the creative process is ruined. Blogging by committee will never work. It goes without saying that the person chosen must be the right person for the job. You would be surprised how many times I have walked into a business and found the office junior is running the blog. Another point would be not to write the articles with search engines in mind. You end up with a glossary of terms you want to be found for and not something that is even nearly readable. If you blog about your industry enough and blog about recent news worthy items, which people will be searching for anyway, you will be found. Awesome steps to visitors become readers especially step 5 ‘Don’t give your great content an ugly apartment’. Wow, a seriously good read, and I think Tito Phillips Jnr’s comment there has really helped hitting home the need for a premium Theme. I couldn’t agree more, I have been trying to help a guy using a site on WordPress.com and it is just not worth it, Have your own place is the first important thing I advise people to do. We’ve found the same — it’s a “basic” point, but if you don’t deal with it up front, it just creates work and problems later that you’ll have to resolve. Since I purchased a theme from StudioPress, I’ve been receiving more blog followers and writing opportunities. One client told me he liked the ‘clean’ lines and creativeness of my website. Also, my new theme fits my personality better. I started guest blogging again, but this time I’m reading blog comments and speaking to blog owners before I approach them with a guest post idea. I want to make sure I’m a good fit for a blog owner’s target audience. I also believe it’s a good idea to develop a business relationships with people. Get to know them and find out how you can be of service. Thanks for this thorough list! Identifying and engaging authoritative influencers, understanding the who, what, when, where and why your content is valuable is so important. Understanding these things 3, 6, 12 months ago and in real time will go a long way to maximize the impact of the content you distribute tomorrow. Great checklist Sonia. Most importantly you’ve taken that ‘buzz word’ content is king and put it into a blog checklist. Thanks Sonia. This list is a great way to motivate people and help them understand that their sites is a perfect marketing tool. However I have yet to find a good list or article to helps them see how much time and effort it takes. Most new sites I’ve dealt with tend to lose their push when they don’t get a lot of visitors after a few weeks. Anyone else tend to notice that? Got any tips? I totally agree with # 1. You don’t want to waste the product of your tears, sweat and blood on a “rented land.” It surely is very painful to lose all your good works simply because it was taken down for no apparent reason at all. Hi Sonia. Just a tip: it’s not Ikea, it’s IKEA. That company’s name is actually an acronym for the owner’s initials and the location of his first workshop in Sweden. Just as you wouldn’t spell it “Ibm” or “Cia”, you also don’t spell it Ikea. I love your posts. Thanks for your work. See you in the Third Tribe. Hey, Sonia, this is a killer list! Point #2, and pulling existing content into cornerstone landing pages – sheesh! Have I been blind? I’ve been looking at these and reading these and loving these for AGES, yet did it occur to me to organize my content that way? No. But I have seen the light, thank you, and it’s next on my list. I already know a few groupings I can make that will make so much more sense out of my blog. Thank you! Sonia, many thanks for this great list. Number #5 is something which has become clear to me of late. I updated my site layout from a standard WP theme to a custom premium theme. One of the major things that I have noticed is that there has been a massive reduction in bounce rate from 40% to less than 10% and a huge increase in average time on site. This gives me more of an opportunity to give value to my readers. I am still in the camp of content is king and if you have poor content no manner of marketing techniques will bring you success, but if you have great content then using solid marketing strategy will grow your audience and result in a greater number of conversions, thanks for sharing your insights. Absolutely top tips – great post. Haven’t seen such a clear informative explanation prior to reading this. I’ll be favouring 1-10. All of them! look forward to your next post. Thanks again. With the step to write well – and you know if there is engagement… could there be a time when there is no engagement because the audience isn’t big enough? what percentage of visitors should be engaging in some way? Thank you! I think, on top of those tips, the most important thing is to write articles that are worth reading and worth sharing. And this has been the biggest obstacle that i am still facing until now. Your words “You don’t decide. Readers decide.” really slaps me in the face. All along, i think i always focus on writing articles that are worth reading for me, not my readers. But thanks to your awesome tip, now i realize that i’ve done so many mistakes in the past. Thanks Sonia for your great post. I have started investing my time in content marketing from the past 2 years and the benefits have been significant to say the least. Although I am still learning new techniques, I have managed to build a huge repository of quality content that I can use and re-use. In fact, I now find myself focusing entirely on content creation and distribution to promote my business and have almost completely put SEO on the backseat. Hi Sonia, appreciate this useful checklist. Similar to the advice given on building your email list early, I am of the opinion that it is also important to build your distribution channels early, especially social media. Of course, we do not need to keep promoting our earlier articles incessantly through social media, but I think you can start early by curating articles, and engaging in conversations with your targeted audiences. Similar to an email list, it takes time to build an engaged community on social media as well. A caveat though: I don’t recommend anyone to prioritise social media on top of any other steps you mentioned in the checklist. Please correct me if I’m mistaken about it, thank you! I agree with that — particularly with not prioritizing social media over building your own thing. This blog was a great read! I have been trying to define Content Marketing for a while now, but you have done that and then some with this blog. Your checklist is one that I believe I will be following religiously for the next few months, until I have it memorized. You bring up some fantastic points, especially with how you stated you will need to post your ideas/content on YOUR own site, not on someone else’s. I have created my own website and will share my blogs after I post them there, but I cannot tell you how true your statement is. It does wonders posting from my site then sharing to my other social media afterwards. It also helps drive traffic to my site. Thanks again for the great tips and information that is already helping me succeed. Thanks for the reminder about these key concepts. I’m sure we already all know them, but it’s good to see them written down in front of us every now and again! Sonia, thanks for the awesome checklist. This is exactly what I was looking for. You mention in item #1, not to build on rented land. Does that mean you don’t find value in writing guest posts, even if it is done to reach a larger audience? Or is your comment suggesting not to use a platform on which you don’t “own” the content? Writing guest posts can be very, very valuable — just make sure there’s a good way for your new audience members to come find your site and learn more about you. You’re always going to do some work on sites you don’t control — the key is not to build your entire business there. This was particularly helpful right now. Having just redesigned my site I’m working on creating cornerstone content. But I was wondering if I ought to focus on that or guest posting right now and this article put it all into perspective. I’ve heard you say in the past the cornerstone content is part of the foundation but it’s so easy to get distracted while you’re still building the foundation of a really resourceful site. This is a great list, thanks very much for sharing it. I’m particularly grateful for your comments in point one. I see many influencers promoting the benefits of spending time developing a significant amount of content for platforms like LinkedIn and Medium. While these can be great from an audience building perspective, especially when these posts do well, the negatives outweigh the positives in my opinion. I can’t help but feel that the real long-term winners would be LinkedIn and Medium in this scenario. Yes, I could receive one high-authority backlink per piece of content posted, but this will likely be a fraction of the many backlinks that these platforms will receive from material that proves popular (or that I could receive had I posted the content on my website), leading to ranking benefits for them, not me. Also, there’s no telling what changes could occur with their platforms that could ultimately suppress visibility of the content in future, meaning I’d potentially only enjoy very short-term benefits from such a significant time investment. It’s just too risky a strategy, and I think you’re 100% correct advising readers to post the majority of their content on a platform they own and control. This is a great post Sonia! I think the cornerstone content aspect is really underrated still. I love the process of discovering the perfect cornerstone content and seeing how so much other content flows from there. I’d say a danger for some is a lack of good internal linking to make the site more ‘sticky’. Once the cornerstone content is ironed out and published and other pieces are in the works it’s such a habit to get into to link back to those and have that internal structure easy to follow.